חשיפה רשמית: מרצדס E63AMG 4Matic החדשה בעלת 585 כוחות סוס. לאחר מתיחת הפנים וחשיפת מרצדס E-Class החדשה לשנת 2013. שם ממוקמים זוג אינטרקולרים שתפקידם לצנן את זוג מגדשי הטורבו . כן מרצדס זונחת את המנועים האטמוספרים לטובת מגדשי הטורבו . ו- 4.2 שניות בגרסת סדאן בעלת הנעה אחורית. ועד למהירות מרבית (ללא הגבלה) בת 305 קמ"ש. ומשם להנעה כפולה , בשילוב בולמי מתכוננים אלקטרונית ,בלמים קרמיים 360 מ"מ. וצמיגים במידות : 255/35/19 מלפנים ו- 285/30/19 מאחור. 14.1.13 -24.1.13 ובישראל בראשית 2014. 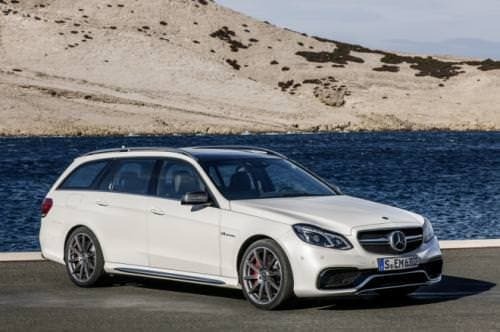 Affalterbach – Mercedes-AMG continues to champion performance, dynamism and efficiency: the new E 63 AMG is now available as a particularly powerful S-Model with an output of 430 kW (585 hp), 800 Newton metres of torque and featuring a newly developed performance-oriented AMG 4MATIC all-wheel-drive system. The AMG 5.5-litre V8 biturbo engine continues to be the absolute pinnacle of efficiency: the combination of high performance and low fuel consumption remains unrivalled by any other competitor in the segment worldwide. 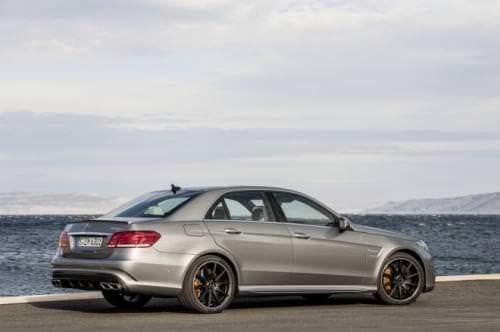 The permanent all-wheel drive is also optionally available for the other E 63 AMG models – on which the V8 engine has been uprated from 386 kW (525 hp) to 410 kW (557 hp), with 720 Nm of torque. With this range, Mercedes-AMG is premiering high-performance passenger car models with an all-wheel-drive system geared to driving dynamics. The CLS 63 AMG also benefits from the new model range constellation: similarly to the E 63 AMG, the Coupé and Shooting Brake will also be available with performance-oriented AMG 4MATIC all-wheel drive. Alongside the successful SUVs – ML 63 AMG, GL 63 AMG, G 63 AMG and G 65 AMG - two passenger car model ranges comprising up to eight unique models with all-wheel drive are now available from Mercedes-AMG in the guise of the E 63 AMG and the CLS 63 AMG. Additional models featuring performance-oriented AMG 4MATIC all-wheel drive, such as the A 45 AMG and the CLA 45 AMG, will follow this year. "'Driving Performance' encapsulates the philosophy pursued at Mercedes-AMG," explains Ola Källenius, Chairman of Mercedes-AMG GmbH. The new model variants of the E 63 AMG and CLS 63 AMG clearly demonstrate how we are now offering our customers even more individuality. 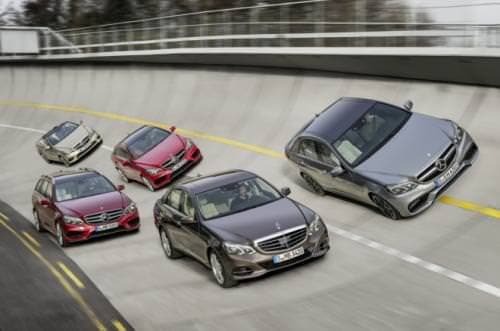 The S-Models in particular represent the most attractive proposition in the segment, boasting substantially enhanced value for money: the highest power and torque ratings in the segment, the new performance-oriented AMG 4MATIC all-wheel drive, the new design and substantially more standard equipment and appointments are the outstanding strengths of the new high-performance automobiles from Affalterbach. With the new all-wheel-drive S-Models we will reach new customers and markets." 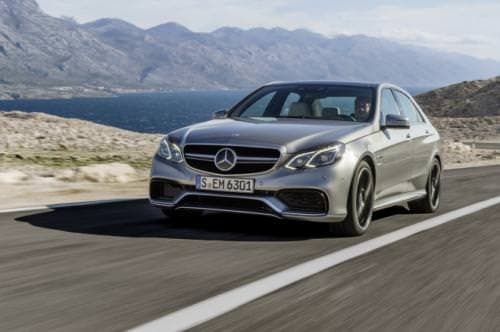 E 63 AMG and the CLS 63 AMG substantially," adds Tobias Moers, head of overall vehicle development and member of the management board of Mercedes-AMG GmbH. "These high power and torque ratings are exclusive to AMG. Our AMG 5.5-litre V8 engine remains the most efficient series production V8 engine in the world. 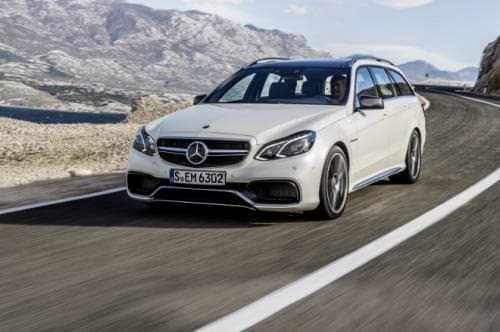 The newly developed, performance-oriented AMG 4MATIC all-wheel drive attains the best acceleration values in the segment, as well as offering our customers markedly higher driving dynamics than ever before." 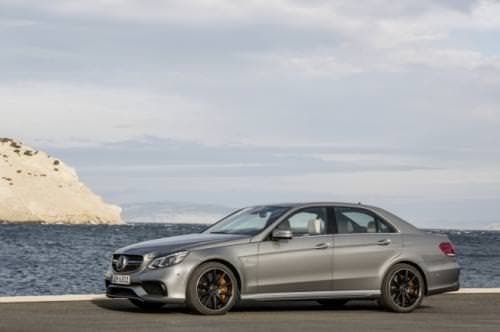 Acceleration to 100 km/h from a standing start in 3.6 seconds provides the E 63 AMG S-Model with a comfortable lead over the entire competition; the top speed stands at 250 km/h (electronically limited). 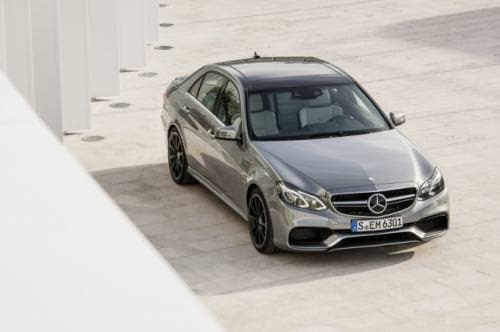 In addition to the increase in output, this is also attributable in no small part to the performance-oriented AMG 4MATIC all-wheel drive with a power distribution ratio of 33 to 67 percent (front/rear axle). Perfect traction during acceleration effectively avoids slip-induced losses. On the new S-Model the AMG 5.5-litre V8 biturbo engine generates a maximum output of 430 kW (585 hp) and maximum torque of 800 Newton metres – representing an increase of 20 kW (28 hp) over the AMG Performance package which was previously available as an option. This enhanced performance and power results from adaptation of the engine application, an increase in peak pressure and a rise in the charge pressure from 0.9 to 1.0 bar. At 410 kW (557 hp) and 720 Newton metres, the basic model also boasts an increase of 24 kW (32 hp) and 20 Newton metres over its predecessor. 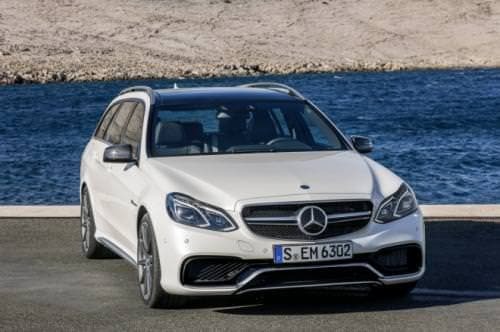 Despite added power and enhanced performance, all models of the E 63 AMG offer high efficiency, low fuel consumption and low exhaust emissions. The AMG 5.5-litre V8 biturbo engine remains the most efficient series production V8 engine around – with substantially more cubic capacity than its direct competitors. 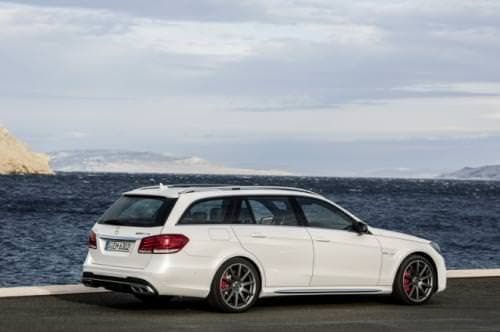 The E 63 AMG rated at 410 kW (557 hp) with rear-wheel drive runs on 9.8 litres of fuel per 100 kilometres in accordance with NEDC (230 grams of CO2). The variant with performance-oriented 4MATIC all-wheel drive and the S-Model rated at 430 kW (585 hp) with all-wheel drive display only marginally higher fuel consumption, at 10.3 to 10.5 litres per 100 km (242 grams to 246 grams of CO2). As an additional boon, following the implementation of internal engine measures all E 63 AMGs meet the requirements of the stringent Euro 6 emissions standard which will not enter into force until 2015. Maximum individuality and customised dynamics – these are the special strengths of the AMG SPEEDSHIFT MCT 7-speed sports transmission. The four modes – "C" (Controlled Efficiency), "S" (Sport), "S+" (Sport plus) and "M" (Manual) – offer the driver a personal set-up. In "C" mode, the ECO start/stop function is active and switches off the eight-cylinder engine when the vehicle is at a standstill. In addition, the transmission characteristics are tangibly soft, with smooth and early gear changes. Second gear is generally used as the starting gear in this mode. The engine and transmission are far more agile in "S", "S+" and "M" mode; in addition, the ECO start/stop function is deactivated. Partial suppression of the cylinders proves perfect for an emphatic driving style: briefly and precisely interrupting ignition and injection under full load leads to even faster gearshifts with a more emotional sound than before. An automatic double-declutching function for downshifting and the RACE START function are also included as standard with the AMG SPEEDSHIFT MCT 7-speed sports transmission. The performance-oriented AMG 4MATIC all-wheel drive distributes the engine torque at a ratio of 33 to 67 percent (front/rear axle). 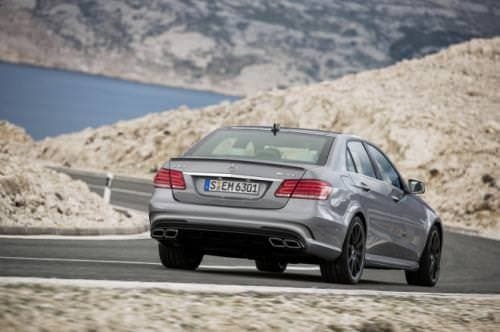 The rear-biased power distribution provides for signature AMG high driving dynamics and superlative driving enjoyment. The 3-stage ESP® has been tailored specifically to the permanent all-wheel drive system. In "SPORT Handling" mode, the Torque Vectoring Brake performs selective braking intervention on individual wheels in the interests of high agility, thereby avoiding understeering when turning and cornering. In bends, specific brief braking of the inner rear wheel results in defined cornering of the vehicle. 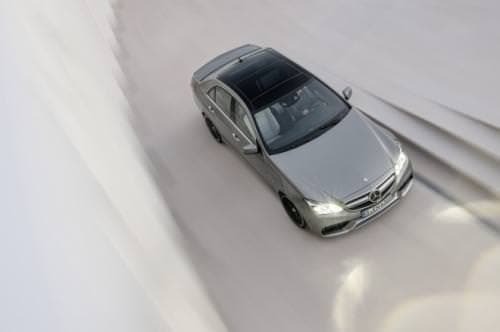 The AMG 4MATIC all-wheel drive enhances driving safety and grip on wet or wintry road surfaces. Optimum traction is guaranteed by a multi-disk clutch with a locking effect of 50 Newton metres which exploits the frictional connection potential of all four wheels to the full on snow and ice in particular. The technical basis is provided by a transfer case for the additional power take-off to the driven rear axle. This transfer case is integrated compactly into the AMG SPEEDSHIFT MCT 7-speed sports transmission and requires virtually no additional installation space. The torque is transmitted from the power take-off via a propeller shaft to the front axle. Power transmission from the front-axle differential to the front-left drive shaft is effected via an intermediate shaft which passes through an encapsulated shaft duct in the engine oil pan. The compact and weight-optimised design results in a comparatively low level of additional weight for the all-wheel-drive system of only 70 kilograms. 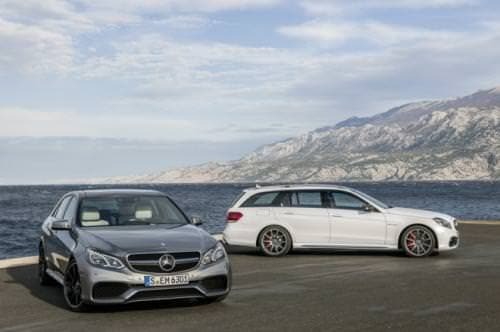 The E 63 AMG S-Model sees Mercedes-AMG going one step further. True to the "Driving Performance" philosophy, the most powerful E-Class is additionally fitted with a differential lock on the rear axle. This high-tech package results in a further increase in traction, ultimately leading to even greater driving dynamics and enhanced driving enjoyment, especially on the race track. S-Model, and offer the driver maximum neutrality and even better feedback and grip at the critical limits. 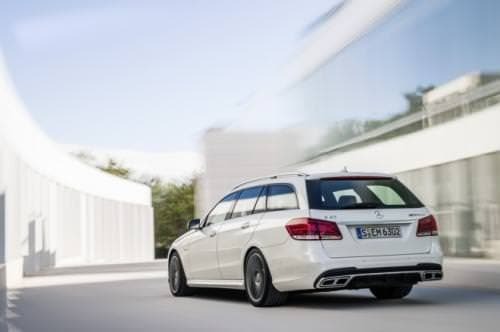 With rear-wheel or all-wheel drive, the E 63 AMG's 48 millimetre wider track at the front offers substantially greater stability at high cornering speeds and improved road feel. Increased negative camber on both axles additionally boosts lateral dynamics. Electromechanical AMG speed-sensitive steering complements the vehicle's set-up to perfection, the direct steering ratio of 14 : 1 providing for extremely agile handling in bends in conjunction with the variable servo assistance geared to the given suspension mode. The E 63 AMG is fitted as standard with 10-spoke AMG light-alloy wheels painted in titanium grey and featuring a high-sheen finish. Tyres in size 255/40 R 18 are fitted to 9.0 x 18 wheels at the front, while the 9.5 x 18 rear wheels have 285/35 R 18 tyres. The all-wheel-drive and S-Model come with tyres in size 255/35 R 19 (front) and 285/30 R 19 (rear) on AMG light-alloy wheels in size 9.0 x 19 and 9.5 x 19. Only the high-performance S-Model features 10-spoke light-alloy wheels painted in matt titanium grey with a high-sheen rim flange. 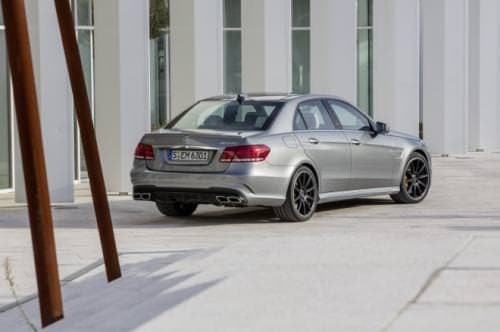 The E 63 AMG is equipped with an extremely effective AMG high-performance braking system befitting its status as an AMG automobile. The front and rear axles sport ventilated and perforated brake disks in ample 360 millimetre format. The disks which are subject to particularly high levels of stress and strain on the front axle feature the composite braking technology which has been tried and tested in the field of motor sport. Callipers in a silver painted finish with white AMG lettering and incorporating six pistons (front) and four pistons (rear) provide for spontaneous, fading-resistant deceleration and the shortest stopping distances. Callipers in a red painted finish distinguish the S-Model. 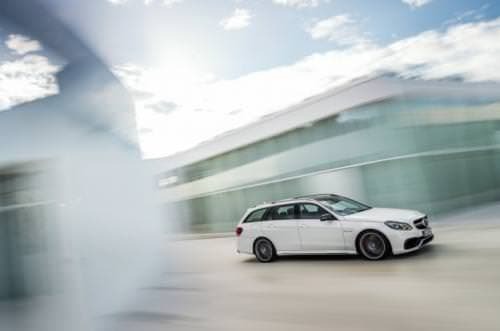 The dynamism and performance stemming from the fascinating technology of the new E 63 AMG are also transported by the design as defining attributes of the vehicle. The AMG high-performance automobile sets new design trends in the process. 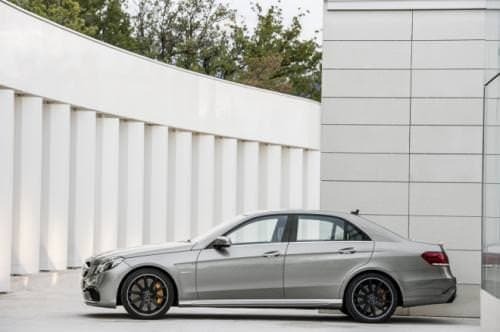 The E 63 AMG is the first AMG model to present the new AMG design philosophy. Predominant elements are the AMG "twin blade" radiator grille in silver chrome and the so-called "A-wing". 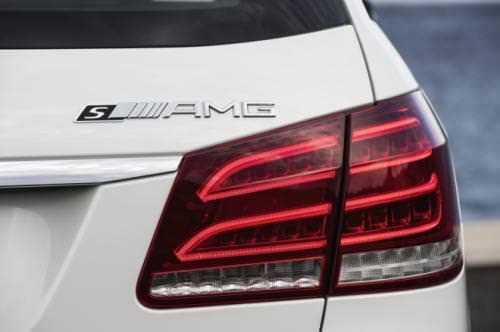 The new, three-dimensional air deflector spans the entire width of the AMG front apron, presenting the stylised "A" which is a hallmark of AMG vehicles. The "A-wing" painted in the car's exterior colour with a trim strip in silver chrome provides the backdrop for three large cooling air intake openings. On the side air intakes, black flics provide for an ideal inflow of air into the cooling modules, while at the bottom a front splitter painted in the car's exterior colour helps to reduce lift. 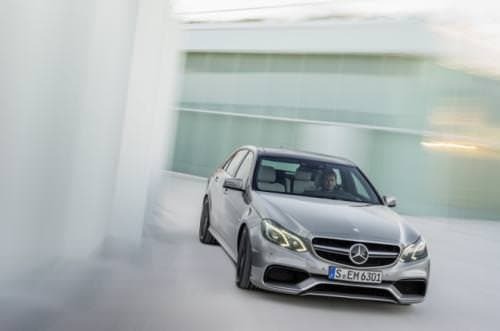 Convex and concave surfaces dynamically combine the new front end of the E 63 AMG featuring a sculptural design with the distinctive flared wings on which "V8 BITURBO" lettering alludes to the superior engine power on board. The striking air outlet openings at the sides, the black grille and the two sets of twin chrome tailpipes belonging to the AMG sports exhaust system provide an impression of width at the rear. The black diffusor insert with pronounced fins lends the E 63 AMG a powerful touch of race track atmosphere at the rear. 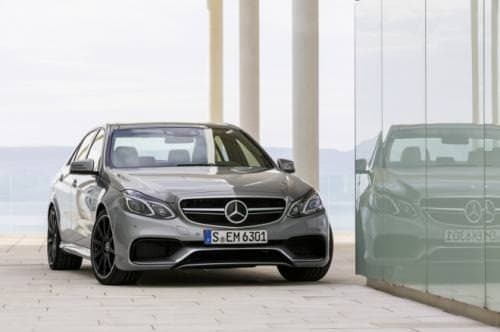 Numerous newly designed, even more striking design features set the E 63 AMG S-Model apart from the basic model. The "A-wing" at the front cuts a fine figure in high-gloss black, for example. The front splitter is finished in silver chrome, as are the striking three-dimensional inserts in the side sill panels. The rear end presents a powerful impression by virtue of the trim strip in silver chrome in conjunction with the two sets of distinctive twin chrome tailpipes belonging to the AMG sports exhaust system. The AMG spoiler lip (on the Saloon only) painted in the car's exterior colour reduces lift at high speeds. The 10-spoke AMG light-alloy wheels in a matt titanium grey painted finish with high-sheen rim flange fit snugly in the wheel arches with tyres in size 255/35 R 19 at the front and 285/30 R 19 at the rear. Brake callipers in red painted finish and an AMG logo on the trunk lid sporting an "S" in contrasting black are other characteristic features of the S-Models. When the customer so desires, the interior of the E 63 AMG S-Model features grey contrasting stitching on the AMG sports seats, the door centre panels, the door armrests and the centre console. Silver seat belts are also on board in conjunction with a black interior. The rim of the AMG Performance steering wheel in black nappa leather is flattened at the top and bottom and boasts grip areas in Alcantara®and grey contrasting stitching. The front head restraints of the AMG sports seats incorporate exclusive embossed AMG emblems. 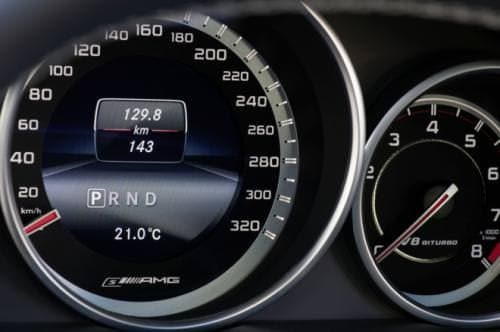 The AMG instrument cluster in a new design features an "S AMG" logo on the 320 km/h speedometer and red applications. The standard scope of equipment and appointments further includes AMG door sill panels with white LED illumination, an electrically operated rear roller blind (Saloon only) and the anti-theft protection package. 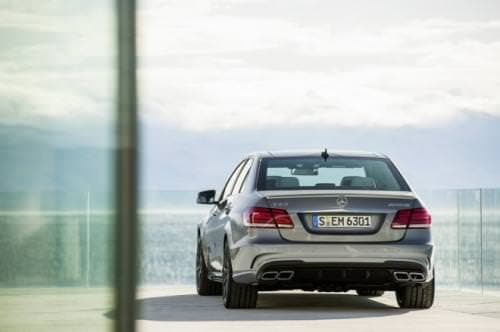 Superior-quality materials, excellent workmanship and an exclusive atmosphere are common to all E 63 AMG models. The new AMG-specific analogue clock in IWC design is an attractive eye-catcher between the two central air vents. A very special highlight among the optional equipment and appointments for the E-Class Saloon and Estate is the Bang & Olufsen BeoSound AMG high-end surround sound system, developed by Mercedes-Benz and Mercedes-AMG together with renowned Danish audio specialist Bang & Olufsen. The sound system also offers playback in Dolby Digital 5.1 quality and enables an exclusive audio experience of the very highest standard. This performance is made possible by a 1200 W amplifier and 14 high-end loudspeakers with neodymium driver in conjunction with precision distribution of the audio signals by the sound processor. This integrated digital sound processor (DSP) enables the driver to select a special B&O sound menu via COMAND. Front, central or rear sound setups can be selected in True Image™ mode, resulting in an authentic audio experience in the selected listening position. Various sound modes are additionally stored in the "Sound Mode" menu, enabling selection between a "Reference" high-end studio sound and a surround option. While "Reference" focuses on an authentic, unadulterated rendering of the artist's performance, the special surround sound mode is particularly ideal for live or concert music, creating a unique panoramic sound in the vehicle without compromising the natural character of the recording. The illuminated 50 W tweeters featuring Acoustic Lens Technology in the mirror triangles add special highlights. High-quality Bang & Olufsen aluminium loudspeaker covers in "silver chrome" bearing the Bang & Olufsen logo additionally allude to the exclusive character of the Bang & Olufsen BeoSound AMG high-end surround sound system. 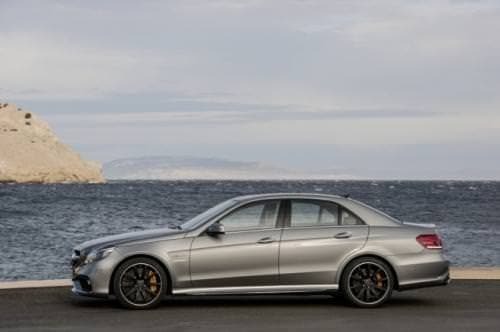 The market launch of the new E 63 AMG with rear-wheel drive will begin in April 2013, with the all-wheel-drive E 63 AMG and the E 63 AMG S-Model following in June.